The 2007 TNAB season is officially over. We started way back in March, with a short jaunt up Lil Si, and closed out the last week of September with a sprint to the summit of Mt Catherine. Over that span, we did 28 different hikes. We arrived at the trailhead, just a few yards short of Windy Pass, under increasingly overcast skies. For once, there were no bugs! We were on the trail by 6:17 PM. At first, the trail seems like an old road, but after a few minutes it narrowed down to standard size. The grade is even, which allowed for quick travel. I had vague memories of slogging along Catherine's ridge with dicey back in February, but it hardly felt the same without the deep snow and blizzard conditions. Often, I felt the trail would terminate over the next rise, only to be confounded by next section of ridge. 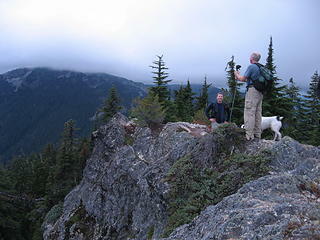 Then, at 6:55 PM, we ran into first Digger the Dog, then Larry on the summit. It took less than 40 minutes to reach the top! For such a short hike, Mt Catherine's summit offers some nice views. We could see much of the immediate vicinity. After a few minutes of summit celebration, a couple folks noticed that some wet stuff looked like it was heading our way. Party over! The trip down the mountain was just as fast as the ascent. By 7:43 PM, we were packed up and heading for the NBB&G - gotta love TNAB! Special mention: (Geo)Tom, along with Jasper, climbed Tinkham prior to joining the Mt Catherine expedition. Cool! And Rick, the Newbie, who did a quick circuit on Tiger Mtn before meeting up in Eastgate for more hiking. Nice! And with that, TNAB is "done" for 2007. Don't worry, 2008 is right around the corner! I'm bummed that I didn't get to make more TNAB hikes. But next year is a new year. I'm working an earlier shift at work and should be able to just drive in to work one day a week. I'll likely post some snowshow and XC ski trips. Hmm - short honeymoon for newlywed Chris, apparently . I had hoped to get in at least one more TNAB trip this season, but work and vacations conspired against. I will remain a mere "newbie" (per Chris) until next season. Congrats on another solid string of outings! Here are a few shots, quality lacking but good subject matter. A big thanks to Mark. This was my first TNAB year and I made it to 14 events. All of them memorable. TNAB Finale has such a final ring to it. A definite ending. Wow, 28 weeks of TNAB huh? Interesting how much that timeframe coincides with huge events in my life. I thought of TNAB all day, and though I wasn't physically there, I was there in spirit. I'm sure you all missed me, yes? While I was missing you all, I was having a very successful Day 4 in Nursing School. Finally settling in and enjoying my instructors, my classmates, and the material we are learning. Loving every sleep-deprived minute of it. 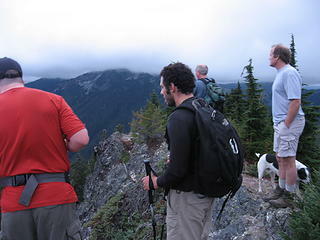 Like you, Steve, this was my first TNAB year. I made it to 22 out of the 28. All, all, all of them memorable for me as well. Even the ones I missed! (Catherine, Humpback, Guye, Rampart Ridge, Teneriffe, and Washington). Thank you TNAB. Thank you Mark. For everything. The peaks, the rocks, the lakes, the adventures, misadventures, the stars and the moon. And for the opportunity to make great friends such as I now have. Having just found out what TNAB is, thanks to Magellan, I look forward to joining you next year. Talk about hiking with rock stars! Is there a secret ritual to get in? A special handshake? Wait, don't tell me the new guy buys the beer. I've heard that one before (he says as he digs deeper into his pocket). What the crap?? I just got back from deployment and was looking forward to hiking again and it's over. OVER! Oh well. Atleast snowboarding season is right around the corner.